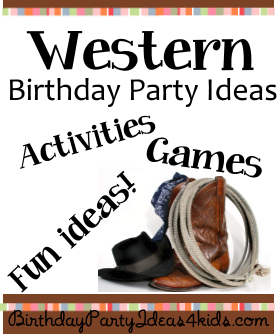 Western theme birthday party ideas for kids, tweens and teens ages 1, 2, 3, 4, 5, 6, 7, 8, 9, 10, 1, 12, 13, 14, 15, 16 years old. Fun ideas for twins, siblings or anyone who likes cowboys, cowgirls or western themed party ideas. Games, Party activities, Invitation ideas, party favors, party food and more! Print out party information on large address labels. Then stick the labels on colorful bandanas and pass them out to party guests as an invitation. On the invitation ask the guests to wear the bandana to the party. Ya Hooo! Party time in the ________ (last name of birthday child) corral. RSVP by ________ so we'll know to be expectin' ya! Boots, Hats, Spurs, Bales of hay, and Rope are great items to use to decorate a Western Theme party. Use Bandana printed fabric for the tables and / or tie them on the back of the party chairs with rope. Bandanas can also be used as placemats or napkins. White tablecloths with bandana printed napkins, plates and cups. Place non spiny cactus plants on the table in terra cotta pots. Make covered wagons easily using a wagon, two hula hoops and white muslin. Attach the hula hoops standing up inside the wagon. Then cover with the muslin. Tie a bandana around a golf ball or other small ball and have party guests try and toss the bandana into the cowboy hat. Instead of one hat you could line up five hats in a row and have the kids try and get the bandana into the hats one at a time starting with the hat closest to the starting line. Make up several relay races and let the children run them with their mop horses. Or buy two stick horses and let the kids trade off with each other. Western Dress up relay - Gather two sets of western themed clothes including overalls, cowboy boots, cowboy hat, sunglasses, flannel shirt, etc. and place them in two separate piles a good distance from where the teams will start. Divide western party guests in teams. The teams first person runs across to the pile of their teams western clothes, put everything on, run back to tag their team - then back again to the pile and take off the items. They then run and tag the next team member in line and that person continues the relay until everyone takes a turn. Teach the guests how to play the game of horseshoes. The rules and set up are easy and it is a lot of fun to play at a party. Here is everything you need to know about how to play horseshoes. Quesadillas - 2 flour tortillas grilled in a little butter with cheese in the middle. Cut with a pizza cutter into triangles. If possible to have a campfire - roast hot dogs and make smores’ over the fire. Lay a bandana flat and place the party favors on top. Fold the sides of the bandana around the party favors and then tie with raffia or ribbon.